The last time they held the U.S. Open at Shinnecock was in 2004 when Retief Goosen shot a one over par 71 to hold-off Phil Mickelson by two shots on a day when the average score was 78.7. That was the year the USGA was accused of losing the golf course as no one broke par and 28 out of 66 players didn't break 80. Suffice it to say that the players were pissed and rightfully so - you can read some of the choice words they had for the USGA here. 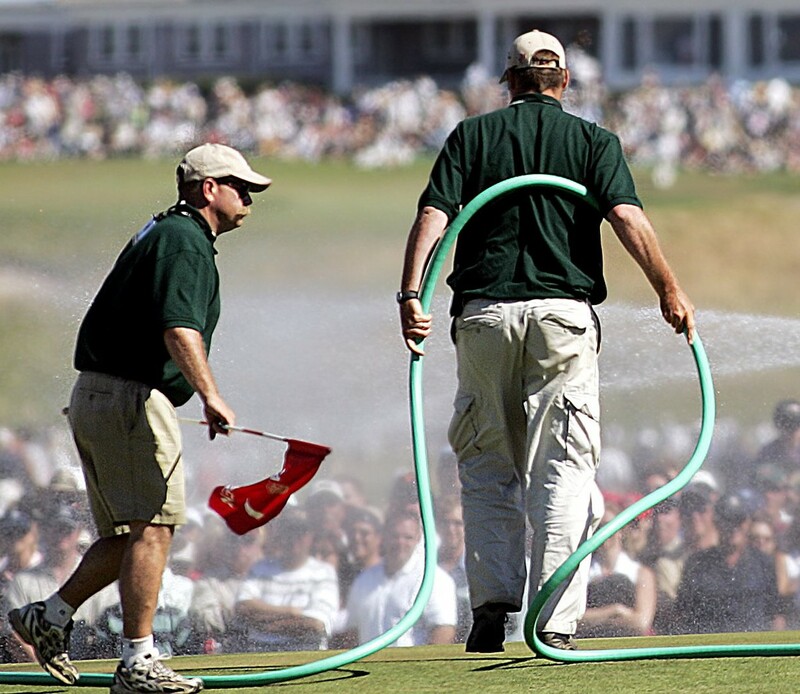 The lasting memory of just about anyone who watched it is a 7,000+ yard stretch of windswept hard pan with balls randomly bouncing and rolling all over the place with maintenance crews scrambling to water the 7th green mid-round like it was on fire. 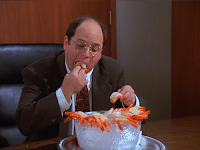 All credit to Goosen for surviving it but, by any measure, it was an awful showing for the USGA and a waste of one of golf's best venues (who knew they were just getting warmed-up?). Look at it his way. Vegas can have Rory, JT and Rickie as their 2-3-4. I'll take Justin Rose, Jason Day and Jordan Spieth. Which side of that bet would you want? Yeah I thought so. (For those who find the other side of that bet more attractive primarily based on my horrid track record of late . . . um I got nuthin'). Let's call those six guys along with DJ "Tier One" and start working our way down from there. Hey look, we've got ourselves a new preview format! In the three years before the faux U.S. Open at Erin Hills where he missed the cut, DJ went 1st, T2 and T4. In 2015 and 2016 when he was healthy and on top of his game as he appears to be now, he finished top ten in six of the eight majors. If he has his "A" game this week, someone else is going to have to shoot lights-out to beat him. The three guys who have the ability to raise their game to that level are Rory, JT and Jason Day and of those three, I like Day's chances the most based on his 2018 form and the fact that he's had five top ten finishes at the U.S. Open in seven tries including two runner-ups. Also, you know he's winning at least one more major at some point and it's probably going to be this one. familiar pose for young Jordan. Jordan Spieth has been struggling a bit but there is no one currently more likely to go straight from slump to major winner. The short putting is a bit of concern on Shinnecock's diabolical greens but he's a great lag putter and one of the best scramblers in the world. There's a reason he's already won three majors to go along with three runner-ups, a 3rd and a T4th. And that brings us to Justin Rose who has been the best player in the world since the FedEx Cup playoffs. During that stretch, he has four wins and nine other top tens. If I had him available, he'd be my pick this week. The top of Tier Two per DraftKings is Jon Rahm, Tiger Woods and Brooks Koepka. I'm passing on those three and looking a bit further down the list at Henrik Stenson, Branden Grace and Bryson DeChambeau. The first two by virtue of their sheer ball-striking prowess and the third based on the fact that we can't ignore him anymore despite how much some of us want to. I know the feel good stories would be Tiger ($9,200) and Phil ($8,600) but unfortunately, I'm afraid the U.S. Open has become a younger man's game. 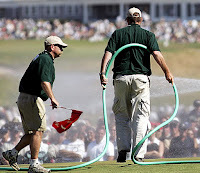 If we're ever going to get that Utopian final round match-up, it'll be at Augusta or maybe at a British Open. We need a fourth guy for Tier Two so let's throw Tommy Fleetwood in there for good measure. He has the potential to be this generation's Lee Westwood. Now we get to the rock solid players who absolutely have the ability to win like Louis Oosthuizen, Adam Scott and Charl Schwartzel. Do I think any of those three will do it? Hell no. Especially not Schwartzel who has demonstrated the recent ability to barf-up a 75+ at any given moment. Seven times in 2018 to be exact but who's counting? (Seriously Charl, you're killing me). would also be the most popular outcome. But three guys I think who could win or at least post a top five are Paul Casey, Alex Noren and Francesco Molinari. They all have that unflappable look that it usually takes to play well at a U.S. Open and Francesco has bee particularly hot lately with a win and a runner-up in his last two starts. 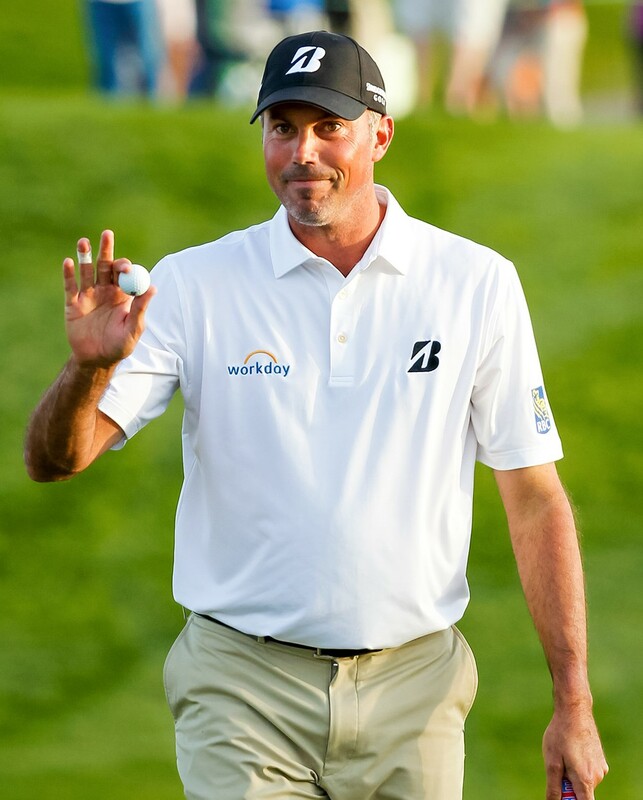 And for the sake of consistency, we need a fourth guy for this tier so let's add Matt Kuchar - the safety school of fantasy golf picks. 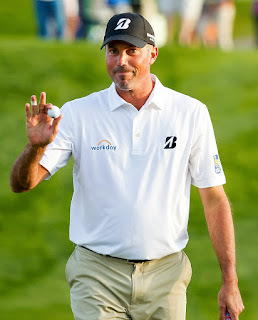 Not to mention, how pleasant would Father's Day be watching Kuch sauntering and smiling his way to a major win? It gets a bit tougher as we enter the space occupied by unproven young players and veterans who have lost a step (and by "unproven", I mean in the majors). Based on their recent success, you could talk yourself into Aaron Wise, Brandt Snededker and Kyle Stanley. No one could blame you for that wrongheaded kind of thinking (I have the best words). Instead I would recommend that you veer towards Jimmy Walker, Ian Poulter and Rafa Cabrera-Bello. Walker and Poulter have been resurgent and Rafa is in the midst of one of those rolls where he racks-up top tens like LeBron racks-up individual playoff stats (there, I said it). For a fourth guy, I'd recommend Kiradech Aphibarnrat with whom I would like to party. Now it's time to get down to the nitty-gritty. These are the guys you need to fill-out that top heavy roster who could make or break your tournament. If I've been good at anything this year (and it ain't much), it's been identifying the value picks (you mean like DFL Keith Mitchell at the Memorial?). The sucker pins at this level are Tyrrell Hatton, Zach Johnson and Jason Dufner but those guys have barely been middling lately. There are more intriguing options. Take a look at Peter Uihlein who finished top five at both the Memorial and the Wells Fargo. Emiliano Grillo is one of the best players in the world when he's on and he's been on lately. Thorbjorn Oleson used to be one of the best players in the world and it looks like he recaptured some of that magic by winning the Italian Open a couple weeks ago over a semi-loaded field that included Molinari, Poulter and Cabrera-Bello. And finally, we need at least one veteran Cinderella story and I'm going with Steve Stricker. I know what I said about Tiger and Phil but Stricker is priced right. He's played in five U.S. Opens since 2011 and finished between 8th and 21st in every one of them. So far this year he's only missed one cut and finished 32nd or better the other six times he's played. If you're looking for a modern day Corey Pavin knock-off for Shinnecock, he's your guy. * So much to unpack from that 1896 U.S. Open. First, the members of Shinnecock must have enjoyed hosting so much that they decided to take seventy years-off. Typical Long Island dickhead move. Second, back then he U.S. Open was only a two round tournament. They switched to four rounds in 1898 after Joe Loyd scorched Chicago Golf Club with 83-79 in 1897 and everyone demanded two more rounds of 8 handicap caliber golf. And finally, if you named your kid "Willie", you dramatically increased his golfing potential. Willie Anderson, Willie Dunne, Jr. and Willie Hoare all finished in the top five in 1897. The following year, Willie Smith joined them meaning there were more players in the top seven named "Willie" than there were not named "Willie." Nice shot Willie. Hey thanks Willie. Willie and I are having a drink with Willie after the round. You in? You bet Willie. ** Note that the dollar values of some of these tiers is compressed because DraftKings crams a bunch of viable options for the majors into the $7,200 - $8,000 range. Not the way I'd do it but hey, I'm just a caveman.